Bruce educating some young fairies. What a great day! 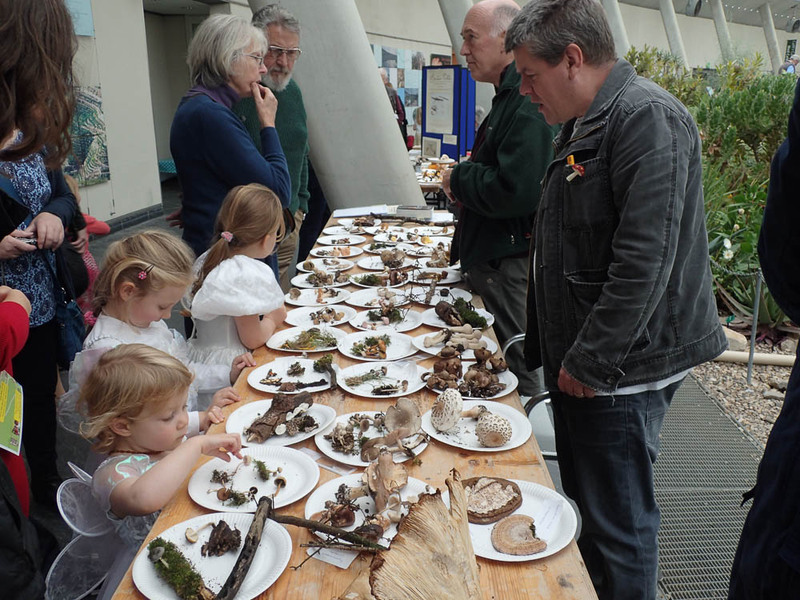 Many thanks to Bruce and his team for organising another superb Fungus Day event at the National Botanic Garden of Wales. Excellent walks and talks. Another success was Tony's Table, which again this year attracted many species, most of which ended up with a name. How many exactly Linda? As it did last year, the table seemed to act as a focal point for the whole day and will hopefully become a regular feature from now on. Once again well done.! Some of the many species of fungi on Tony's Table. And thank you, Peter, Lynda and Philip in particular for being so supportive Colin. Great to see Tony's wife and daughter, Di and Emily, with their bag of fungal goodies, as well as regular supporters such as David Mitchel, Ray Woods and Gary Eaton. I thought Kate Jones' Beatrix Potter display was great too. We had 534 visitors, around 100 more than we've had before - numbers go up every year which hopefully shows the growing interest in fungi in the county. We had 45 named fungi and quite a few more without.